LED technology is continually developing and is finding increasing acceptance in medical technology. The quality of LED illumination however can vary greatly. HEINE is only using LED technology if the new illumination means no compromise in illumination quality for the medical practitioner and the use of the product, in terms of both diagnostics and safety. Numerous manufacturers are using LEDs, but often they cannot meet the high demands of medical professionals. 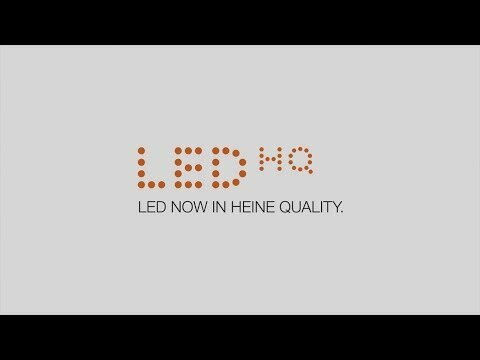 LED in HEINE Quality (LEDHQ) means high-quality, specially selected and individually measured LEDs* that allow an innovative electronic control (patent pending). Light can be a danger to the retina and the skin surface, depending on the intensity and the light source. Certain UV-A rays may be dangerous for the eye. Possible eye damages include conjunctivitis, keratoconjunctivitis of the cornea and also cataract. Negative skin effects include skin burns and loss of skin elasticity. To guarantee the safe use of our light sources, we develop and test our products according to the requirements of the corresponding standards, namely the regulation for photobiological safety according to DIN EN 62471 and/or DIN EN ISO 15004-2 for specific products in the area of ophthalmology. HEINE is testing all of its products according to their intended application and therefore fulfills all relevant standards. a longer lifetime. No bulb replacement necessary. You save time and money for replacement parts. a longer battery life due to the low energy consumption of the LEDs. the environmentally-friendly use (Green Efficiency). * Every production process shows the same phenomenon: even if the manufactured products belong to the same batch, there are tiny differences between them. This also applies to light-emitting diodes. Therefore a process called binning is used by manufacturers in the production process of the LEDs. Binning is a way to group the entire LED production into a smaller number of “bins”. Light intensity is measured in Lux, at the defined working distance of the instrument. Each HEINE LED instrument has been engineered to provide the optimal illumination that is ideally suited for the application. Depending on the application, the LED either is preset to the optimum brightness or can be continuously adjusted in light intensity. The HEINE LEDs have been synchronized with the precision HEINE Optical systems in each instrument to ensure an absolutely homogeneous distribution of light across the entire field of view, including the edges. The result is high contrast, distortion free images with no distracting reflexes, shadows, or disturbing ‘hot-spots’. The CRI (Colour Rendering Index) indicates how exactly colours are reproduced in comparison with daylight. The closer this number is to a maximum of 100, the more accurate the lighting system is, meaning that colours are displayed in their natural state. Red is red. Blue is blue. HEINE LED instruments have exceptionally high CRI values to ensure the examiner sees the colours as they are, for the most reliable and accurate diagnosis. LEDs will only perform at their optimum level in very specific temperature ranges. Operating outside the specified temperature range will affect brightness, colour temperature as well as result in reduction in lifetime and reliable performance over time. Instrument design and special materials such as ceramics, heat conducting foils, heat dissipating bonding materials and aluminum heat sinks are utilised to ensure that the LEDs always operate at the ideal temperature, ensuring consistent performance and a long life. High quality LEDs that are tailored to and properly integrated into the operating environment have a virtually unlimited working life. HEINE LED instruments are virtually maintenance free, with no need to ever exchange the LED. In addition, the high efficiency of LEDs and low power consumption means extended use times and longer battery life.